More than 15,000 members of the public have signed our petitions asking for Newborough forest to be given the protection it deserves and protected in its entirety for future generations to enjoy. If fully implemented the current 2010-2015 Forest Management Plan could lead to all of the most popular & important for tourism areas being devastated. 'Natural Resources Wales' unique concept of conservation ! Destroying significant areas of fixed dune habitats. NRW have destroyed significant sections of excellent mobile dune habitat in the foredunes. Large slacks in the fixed hindshore dune zone have been completely stripped of their characteristic vegetation. This is a unique interpretation of conservation and protection of dune habitats. The public do not consider these actions appropriate and they are against the wishes of significant numbers of the local community. Review of proposals 2013-2015' being used to justify this work. 13-3-2015 Assessment of Welsh Governments Review of proposals 2013-2015 produced. 1-11-2014 Newborough News Issue 10 published - Welsh Government concludes Scientific Review. 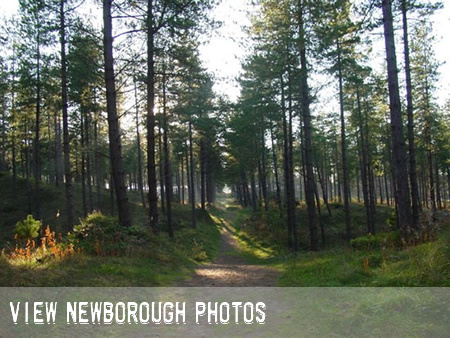 15-5-2014 Newborough News Issue 9 published informing the wider public of the trial felling. This letter received via Rhun Ap Iowerth AM explaining the Welsh Governments position. 'Natural Resources Wales' held a public meeting confirming the trial felling plans in Newborough. Public Awareness Meeting: " NEWBOROUGH FOREST - the FUTURE " held at Eglwys Bach, Newborough, to better inform the public about 'Natural Resources Wales' felling proposals for the Forest. 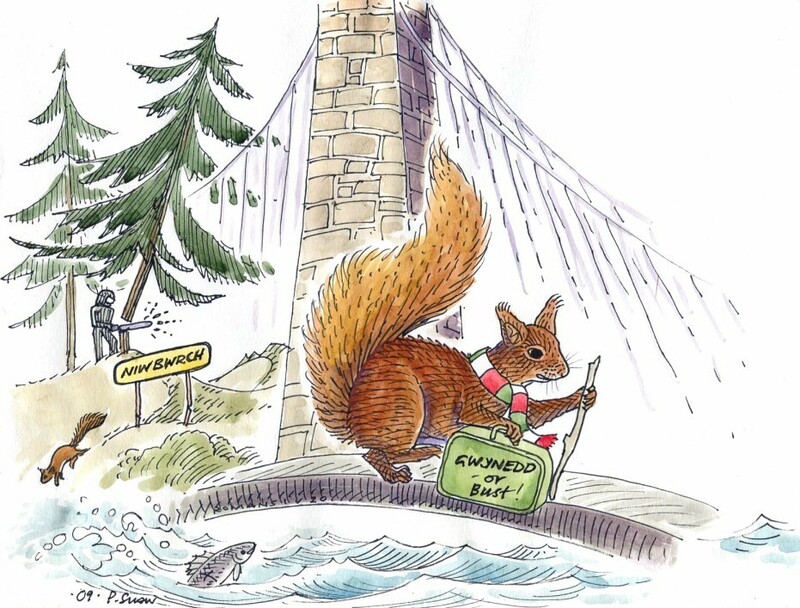 From 01 April 2013, 'NATURAL RESOURCES WALES' have taken over the functions currently carried out by the Countryside Council for Wales and Forestry Commission Wales. 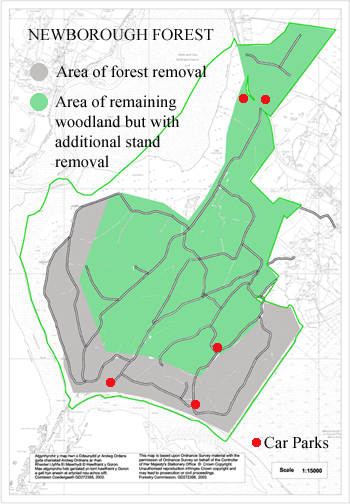 Update giving 'Current Scenario' regarding the proposed felling at Newborough Forest. Public Notice put in the local papers to inform the public about what could happen to Newborough Forest & to direct them to this website for further information. WHY DO WE NEED TO SAVE NEWBOROUGH FOREST? This is a coastal forest in an area of outstanding natural beauty. The intimate link to tranquil beaches & the sea, and views of Snowdonia mountains & the Lleyn peninsula, combined with a rich diversity of flora & fauna, make it a unique & popular destination for visitors throughout the year. It is a haven in poor and fair weather. It has the second largest raven roost in Europe and is a refuge for the protected native red squirrel. It has provided a very desirable location for films: the Demi Moore romantic thriller 'Half Light' and most recently 'Clash of the Titans'. It brings enormous socio-economic benefits to the area and contributes to the overall tourism industry of the Island, which is estimated to be worth £100 million. The Welsh Assembly Government, which owns Newborough Forest, stresses in its plans to transform to a low carbon future, the retaining of carbon in forests and soils. WHY IS NEWBOROUGH FOREST UNDER THREAT? 'Natural Resources Wales', which the former Countryside Council for Wales are now part of, believes that the forest is undermining the conservation status of the adjoining dunes that are protected under the EU Habitat Directive. The CCW were recommending clear felling of 60 acres of the forest in the autumn of 2009 but through protests by the general public and a lot of hard work by the Newborough Forest Protection Group, this felling has since been put on hold. This was to be followed by a further removal of some 600 acres, i.e. 40% of the forest, over the next few years. This would leave the remnant forest at least half a kilometer from the beach and mean eventual felling of over 100,000 trees. This belief is not shared by all. The forest ecosystem has established itself over the last 60 years and is now an important amenity asset for all. CCW's assessment of the status of the dunes is being challenged by other scientists. Greater transparency from CCW is being demanded by the community. EU Habitats Directive requires that social, economic and cultural benefits to the local and wider community are taken into account when planning conservation measures.